8 Auspicious signs called "Asthamangal" embroidery on Fabric door Curtin to protect from evil eyes a..
Kalash, as per buddhist iconography, the Kalasa helds Amrit, the water of immortality. It is also on.. 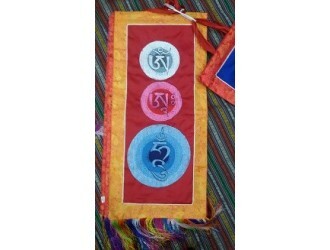 Endless Knot - also considered luck knot, life knot or love knot-Door Curtain-Red..
Hindu Om Wall Hanging- 20 x 28 cm size..
Om Ah Hung Mantra Banner Wall Banner- 7" x 22"..
Om Mani Padme Hum, six syllable innovation wall hanging savior & the protector from danger..
Om Mani Padme Hum, six syllable innovation wall hanging savior & the protector from dange..
Pancha Buddha, They Dhyani Buddha, Door Hanging embroider on silk fabric, hang on main door for good..
Tibetan Om Wall hanging - 20 cm x 28 cm size..
Buddhism and spiritual sings of Wind Horse Door Curtain-Blue..